"It will change the way you think about American politics." Author Michael Lind says, "Fixing Elections is the most important book on American democracy that has come out in many years." 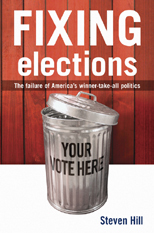 Hendrik Hertzberg says "Here's the eye-opening news from Steven Hill's new book: our 'winner take all' electoral system is a mug's game that makes losers of us all. He explains why -- convincingly. And he tells us what we can do about it." Click here to read what Lani Guinier, William Greider, Robert Dahl, Paul Taylor, Katrina vanden Heuvel and many more say about the book. Click here to listen to video/audio of Steven Hill's presentation on NPR's Cambridge Forum. Was the lesson of Florida punch-cards that we need better voting machines, or that there's something deeply wrong with a system where the candidate with fewer votes wins the office? Fixing Elections shows why it's not just the Electoral College that's outdated, but our entire 18th-century Winner Take All political system, including the way we elect our legislatures. Copyright, © Steven Hill. All rights reserved.